Having lived in Quito for close to 6 months now, there are certain random things that I notice on a frequent basis and I decided to write about them. Public Buses - A lot of the public buses here in Quito produce a whole lot of black exhaust fume that is enough to momentarily blind and choke you, all at the same damn time! Seriously every time a bus is about to drive past me I instinctively hold my breath and put on my sun glasses if I didn't already have them on. The upside of public transportation here though is that it's super cheap, with 25 cents you can travel within the city and cover quite a distance. Weekend shopping madness - We do most of our grocery shopping either on Saturday or Sunday.............. and so does the rest of Quito especially if the shopping is at one of the major economical grocery stores. It is a shopping nightmare because the lines at the cashier are so long that you can easily be stuck on one for more than half an hour. I took the pictures below during our last shopping trip, believe it or not there are several line formations which are not evident in the picture. The best times to shop and avoid crowds are during the day from Monday to Friday, despite us knowing this we still continue to shop on weekends. Popcorn with soup - Yup! you read that right, I had never heard of popcorn being eaten with soup until I came to Ecuador. I remember the first time I went out to lunch at a restaurant and the waiter brought out popcorn and soup, I was so confused and thought he had mistaken my order until I looked around and saw everyone pouring the popcorn into their soup before eating. Now I am so used to it that it doesn't faze me and you know what? it's actually not bad. Almuerzos - Speaking of food I have to say I really do like the concept of almuerzo here in South America. Almuerzo means lunch and usually restaurants will have a set lunch menu of the day that includes: soup, main meal, juice and sometimes even desert. These set menus are usually very economical and cost less than ordering something straight from the menu. The almuerzo of the day can be chicken, beef or even lentils (called menestra in Spanish) and is usually accompanied by rice, some salad and plantain. I know the picture below doesn't flatter the plantain which looks like a snail but believe me, it usually looks better than this. I love sweet plantains! Aji - Still on the topic of food, you will notice a lot of restaurants here in Quito place some liquid concoction on each table. This is usually Aji, a spicy mixture which can be added to food to give it an extra kick. I personally don't think it's very spicy but some people find it too spicy. I usually prefer bottled Aji which appears red and is more spicy but the Aji below also does add a good taste in food. Internet cafes and phone charging services - Every block has at least one or more internet cafes where you can cheaply browse online, make international phone calls, print or make copies of any documents you want and even buy minutes for your phone. I remember one time I needed to print something and I visited one of these internet cafes, I must have been there for close to an hour at least and was expecting a significant bill. You can imagine my surprise when I only ended up paying .50 cents, yup! it is that cheap. A lot of people have prepaid phone plans through Claro or Movistar (I have mine through Movistar), I noticed the same in Colombia and Peru as well so I guess these two companies are major players in this part of the world. Anyway, there are always places where you can buy minutes once you run out, notice where it says "recarga aqui?" it pretty much means that you can top up your minutes from this location, you don't know good it feels to see one of these signs when you run out of minutes and need to make an urgent call. Pharmacies - It's amazing how many pharmacies you will find here, It seems like at every block you can count on seeing: a bakery, an internet cafe and a pharmacy. The good thing is a lot of pharmacies here are open everyday of the week including Sundays which makes it very convenient if you really need some medicine. 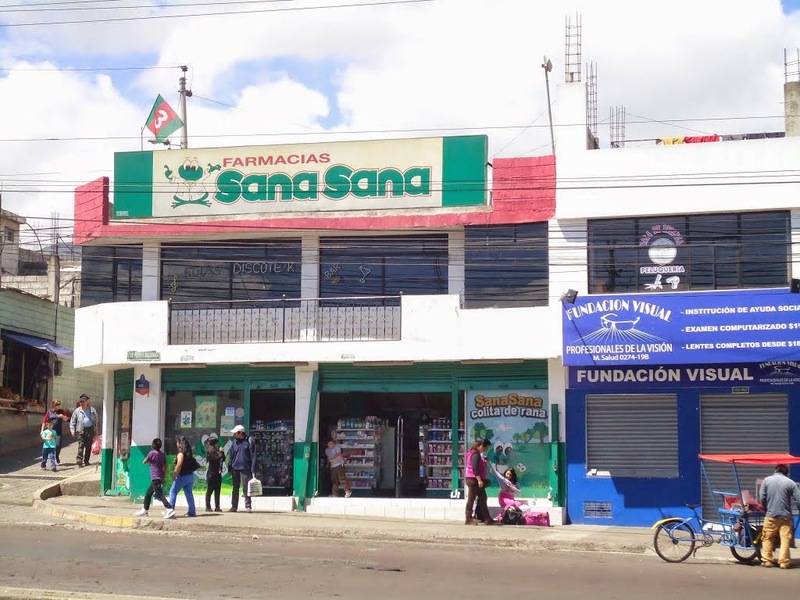 The Sana Sana chain of pharmacies seem to be everywhere, sana in Spanish means health. There are other pharmacy chains as well aside from Sana Sana. Noisy neighborhood dogs - My new neighborhood has several dog owners so you can imagine the noise they make on a daily basis. During the day the dogs seem to be asleep or something because they are so quiet but come evening at around 6 pm until late at night to early morning, these dogs are a riot. They bark so loudly it just drives me crazy. See the cutie below? on this particular day I managed to snap a picture of him/her alone but usually there is a line of about 4 dogs in the same position barking at the cars and people passing below (this is at the very top floor of the building next to our apartment). The dog spotted me taking pictures and decided to confront me before another friend joined in, what cuties! if only they were more quiet. That's it folks, there are many other observations I could have written about but I will stick with these ones for now. I have to say the good thing with traveling and staying in one place for a longer time does help in making you feel like you are part of the community as you slowly assimilate and adapt to local ways of doing things. There is this one street near the Mariscal area in Quito which is very popular with druggies. There is always someone smoking something other than cigarettes or offering you drugs for sale especially at night. I was walking along this street with one of the guy's I work with at the travel agency and I noticed a lot of apples and oranges that seemed to have been randomly dumped around various areas along the street. I pointed this out to the guy and he mentioned that some people use fruits to smoke weed. They cut out holes and smoke weed through the holes so they can get the flavor of the fruit as well, I'll be damned! the new things I learn each day. I never would have known this. The weather in Quito has been weird. One minute the sun will be shining bright and the next, clouds will suddenly gather before a heavy downpour. It's funny but the days I decide to wear sandals or open shoes is when it really pours so I usually end up with wet feet which I really don't like, that's one of my pet peeves. Heck! I don't even like walking on dewy grass early in the morning unless I have closed shoes because I hate the sensation of wet feet unless I am in the shower. Sometimes when I am walking down the street on my way to run errands like make bank deposits for my job or other mundane errands, I think to myself, "wow! I am actually in South America living life as a local, speaking and reading Spanish without major barriers." I never imagined I would be living this life and It actually feels good immersing myself in a foreign land and learning the language and way of life to the point where I feel self sufficient and not lost due to language barriers. Ooh! and I also get excited watching shows in Spanish and listening to Spanish music where I can understand what is being said without too much effort as before. I have to say I am very proud of myself! I love it too although I still find it milder than what I am used to but it sure does give a certain kick to bland food.